The entire report is based on a whopper of a lie. It is told first in the foreword by Dr. Thomas R. Frieden, the director of the Centers for Disease Control and Prevention, and then in the preface by Surgeon General Dr. Vivek H. Murthy himself. E-cigarettes are not tobacco products: They contain zero tobacco. To describe e-cigarettes as a tobacco product is profoundly deceitful. 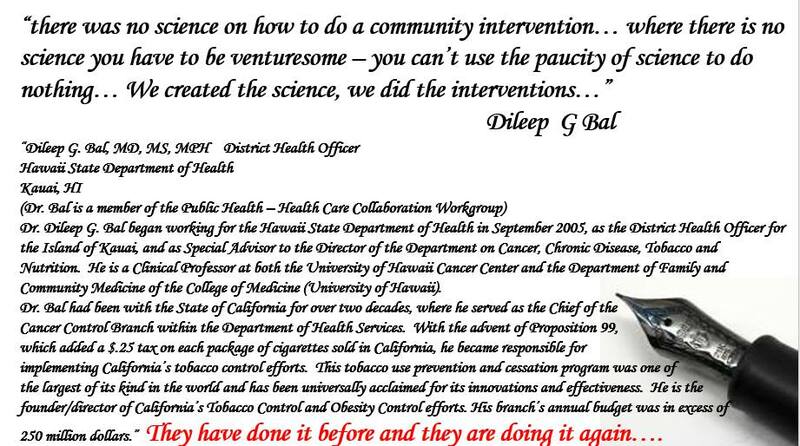 And this factual misrepresentation to scare smokers into not using them is quite deliberate. The mayor of Regina wants to know what people think about expanding a smoking ban to include outdoor patios, playgrounds and other public spaces. Mayor Michael Fougere and a number of city councillors are putting forward a motion at city council tonight, which would have city staff come up with ways to consult the public on expanding a provincial smoking ban. “I suspect we’ll be making some changes,” Fougere said in a telephone interview. He says while he expects some people will oppose an expansion of the ban, other cities have continued to strengthen their own bans sparking concerns that Regina is falling behind other jurisdictions. Saskatoon has had smoke-free patios for more than a decade. A case of non-fatal intoxication with liquid nicotine is diverted by the American College of Emergency Physicians (ACEP) to support US Surgeon General’s unsubstantiated warnings against the e-cigarette. But the issue is somewhere else. The American College of Emergency Physicians (ACEP) reports to the media on the case of ingestion by a child aged of 6 years and links the incident to the recent warnings of the US Surgeon General that qualified e-cigarettes a “major public health concern.” On the other side, the scientific case report  published in the Annals of Emergency Medicine, orientates the debate on the inconsistency of vaping products regulation. A new study by Dr. Riccardo Polosa and colleagues, published in the journal Respiratory Research, finds that smokers with chronic obstructive pulmonary disease (COPD) who switch to electronic cigarettes experience an improvement in their symptoms and have fewer COPD exacerbations. An improvement in respiratory symptoms was observed both in smokers who switched completely to electronic cigarettes and in dual users, although those who switched completely experienced a more substantial improvement. There was a time when it was thought that Parliament was ‘The Government’. Recent events have revealed that that is not so. The ‘Government’ consists of ‘Experts’. It did not used to be so obvious when ‘giants’ on the political street strutted about, but it was always the case. Those ‘giants’ were, in reality, pygmies. For example, Thatcher was regarded as a hero when she gave the go-ahead to the repulsion of the invasion of the Falkland Isles. But she did not decide that it could be done. It was the Generals who decided. But what seems to have happened in the recent past is that the Generals now dictate what should be done. The people that we elect do not decide. They are imprisoned by their own ignorance. The severity of the FDA Vaping regulations have caused lawsuits and a number of other controversial reactions. Senator Ron Johnson made written demands for an explanation to be received by specific dates he set. In all, Johnson has written the FDA three times and he finally received a response in which the FDA seemed to only create a more questionable and unclear scenario. All of this is important to research and reflect on, but what’s even more significant is the overall repercussions that countless American workers, business owners and families will be negatively affected by this transition the FDA felt the need to install and enforce. Does the FDA truly understand what it is that they’re doing? It could be interpreted that they have no idea what it is they’re creating and destroying simultaneously.